As content writers and marketers, you should know Google Hummingbird criteria to avoid being penalized. For each update that Google algorithm makes, it aims at giving its users the most relevant search engine results. These famous Panda, Penguin, and now, Google Hummingbird may penalize your rankings. Hummingbird at worst, may revamp the whole search algorithm. How does Google Hummingbird affect your content strategy and your businesses? Previous algorithms allow marketers to pay attention on creating content of high quality for its audience. Now, marketers wonder if they have to change their content strategy to avoid being penalized by Google Hummingbird. Develop useful and relevant content. Take note that Google Hummingbird only recognises useful and relevant content. Records show that more and more users are searching in the form of questions. This means that you have to create content that answers these questions or question that may tend to appear in search engine result pages or SERPs. But searches that are not in the “form of questions” or the common use of phrases or keywords should not be ignored also. Create content that responds to very particular or long-tail searches that corresponds to search intent of users. When users search for the “best web developers for business websites,” then, Google furnishes searchers a page with lists of the best web developers for ecommerce, not just 3 cases. Hence, create content which is more particular for search intent, not in general context. Know the value of mobile devices. There are more than 40% searches that come from mobile devices. With this increasing trend, online marketers should research and create content and optimise it for mobile usability. 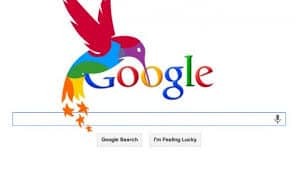 With Hummingbird, Google can provide its mobile users with better search engine results. Remember to create content that answers to searches that are in the form of question and are in conversational form. This is what Google Hummingbird loves. Optimised mobile website becomes a necessity. The best way to obtain pleasant mobile experience for users is by owning a responsive web design. What’s with responsive web design? It uses media to determine the resolution of the mobile device. Then, it responds to the version that matches the resolution. Responsive web design, therefore, allows businesses to develop websites that work with desktop and on any mobile gadgets. Thus, if your website is not yet optimised for mobile devices, it is now the right time to transform it. Have a responsive web design that works well with any mobile device to provide users a great online experience. Recognise the power of social media. With Google Hummingbird, Google warns marketers never to ignore social media. Quality links are considered the most significant aspect in search engine rankings. If somebody links to a website, it seems he/she gives an approval vote. This means that the user views the website as relevant and meaningful. With social media does not focus on giving approval to content but on sharing content to social media accounts. However, no one has proven insight on how social media affect search engine rankings, especially with Google Hummingbird in place. When marketers are trying to build and nurture credibility for your business across various platforms, they should incorporate it as part of online marketing strategy, instead of rankings only. With Google Hummingbird, content strategy will be based on your existing online marketing strategy. If you are focusing on previous updates that involve Panda and Penguin and create quality content, then, Hummingbird will not affect that much. When you find that your web traffic drastically drops due to low quality and relevant content, then, you know it is time to transform your website and create content that are according to Google Hummingbird criteria.